Everton FC celebrate the 2019 Weeks Of Action. Level Playing Field get a tour of the fantastic new accessible facilities at Goodison Park. This Saint Patrick’s Day Level Playing Field Chairman Tony Taylor and Development Officer Neal Hickey were invited to Goodison Park to celebrate with Everton for this years Weeks Of Action. We were hosted on the day by the club’s Disability Access Officer Rachael Lomax, who since taking the role with the club has done brilliant work at the club for disabled supporters. Rachael invited Tony and Neal to speak at the club’s Fanzone with lifetime Everton disabled supporter Mike. This gave Level Playing Field an opportunity to speak about what they do as a charity and and Mike an opportunity to speak about his experiences with Everton Football Club. 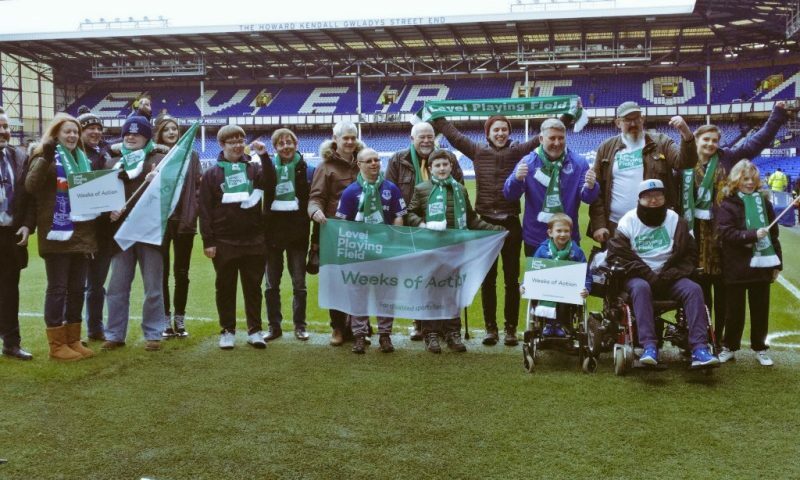 Some members of Everton’s Disabled Supporters Association were invited along with Level Playing Field to take a picture on the pitch to celebrate and recognise this years Weeks Of Action. Rachael the club’s DAO then brought Tony and Neal on a tour of the accessible facilities. The tour started at a building that is owned by Everton in the Community. On a match day the bar is opened, and screens are set up showing the earlier matches. This service is set up for disabled supporters and their personal assistants. It was one of the many perks of being a member of the Disabled Supporters Association. The tour then moved to a local school again owned by Everton in The Community. At the school the DSA were trying to meet more disabled supporters and getting sign ups for the clubs DSA. The tour then moved back to the ground were Tony and Neal were able to see the brand new wheelchair user platforms. The platforms were absolutely fantastic and whilst having a brilliant view of the game also allow disabled supporters to be with their fellow supporters. Neal said “The work that Rachael and Everton are doing is fantastic and by creating accessible and inclusive opportunities for disabled people to engage with the club it will only enrich the social fabric of the club”. If you have any Weeks Of Action stories that you want to share with us please send them to info@levelplayingfield.org.uk or call us on 01923 545370.